Hi all! Happy Pre-Friday! I'm super happy to share that I have partnered up with Piperlime to style a look for their #momentsofchic campaign. I have been a huge fan of the site for years and a loyal customer ;)..so you can imagine how ecstatic I was to be able to do this! If you've been following my blog for a while, you know I have a weak spot for florals...and thanks to my friends over at Piperlime, I have yet another beautiful floral piece to add to my wardrobe! I decided to pair it with a simple striped sweater, dainty gold and silver jewelry and my new favorite black heels for a walk around my neighborhood. My favorite thing to do is to pair print with print. In order not to be overwhelming, pick a color that resides in both prints (which is black in my case)! How would you style prints? Aww you look gorgeous and chic and i love your skirt! 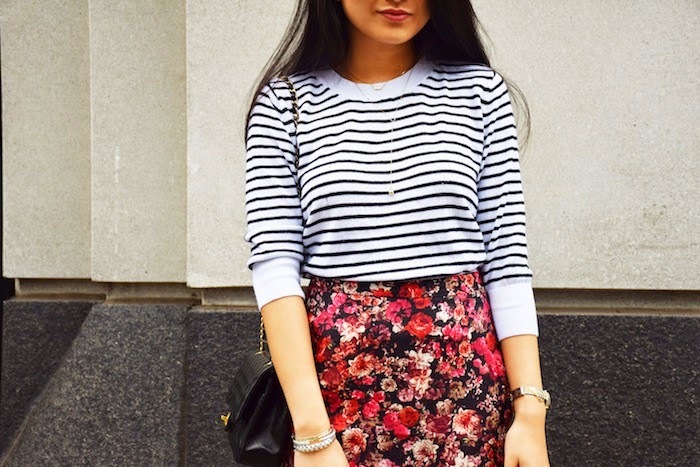 Love the mix of the pretty floral print and the stripes! This skirt is perfection. You look beautiful!